The destruction of the 50th seal of the Roboplastic Apocalypse is the catastrophic Polish Club convention party event of the year! And I could think of no more catastrophic Polish Club convention party to record it at than PalmCon 2012! Thrill to the adventures of the Nostrodomotron as I go around PalmCon interviewing sketch card artists from the upcoming EnterPlay/Breygent marketing Transformers trading card set! Then listen in horror as I wander the convention floor talking to myself about 28 year old toy robots newspaper ads and wondering what the proper etiquette is when the toy robot the dealer just handed me breaks apart in my hand. And if that wasn't exciting enough, you also get to hear me doing the toy robot collector equivalent of dumpster diving in the cheapie bins for one dollar Zybots. But wait there's more! How many Shogun Warriors #1s could you buy at PalmCon for a dollar? Which sketch card artist thinks Lionel Playworld was a cheap knockoff of Toys R Us? Were Hound and Jazz the Adam and Eve of the Autobots? Find out all this PLUS a José Delbo update in this MICHAEL BAY HASN'T APPROVED THIS YET edition of the podcastalypse! José Delbo was at PalmCon! I got to talk to him but unfortunately he was kind of sick and in no shape to do audio interviews so I didn't ask. But I did find out about what he's up to and what SuperDuperComicConvention he'll be appearing at in the future! Then go to JoseDelbo.com! Steve Lydic is an illustrator who drew sketch cards for the upcoming EnterPlay/Breygent Marketing Transformers trading card set. He talked about why he went with characters from Transformers:Prime for many of his subjects even though he really loves the old robots, too. Check him out at his Deviant Art page ~stevelydic. Banky also did cards in the upcoming Transformer set and decided to take on robots from the Michael Bay movies. She talked about what it's like drawing Michael Bay's robots knowing Michael Bay would have final approval of her art! Check out some of her Transformer sketches at her Deviant Art page ~BankyOne. Long time friend of the Podcastalypse Mike "Locoduck" Duron is seen here rendering some obscure, mega popular and fantastically handsome Japanese super robot. Mike and I talked growing up in El Paso, drawing robots in and out of their disguises, and of course, Sugar Boogarz. Check him out on Facebook at Locoduck Studios and also at locoduck.com. 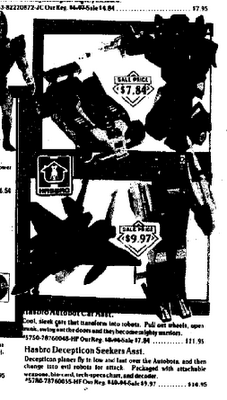 Of course no podcastalypse would be complete without me talking about old toy robots newspaper ads. As I walked around PalmCon I was reminded of a matter of great roboplasticological importance and I promised I'd expand upon it here in the show notes. Well back when I posted the very first Transformers commercial on YouTube I got a comment from "JaredMan328", who laid out a chronology of release for the very first Transformers explaining what robots hit the shelves exactly when back in 1984. This subject is so difficult for anyone to speak with any certainty about that I was impressed he gave it a shot. According to JaredMan328, "the first three Transformers released in the US were Hound, Soundwave with Buzzsaw, and Jazz" and the rest came out between June and September, with the Decepticon jets not seeing release until the cartoon hit. At first it seemed like this theory would be easy to disprove since I knew Transformers shipped in mixed assortments with different robots of the same size class in each case. Yet in all my ad searching and case assortment researching, I couldn't 100% refute Jared's chronology because the earliest ad I had was from August '84 (coincidentally showing only two Hounds) and cases have been found with a bunch of the same robot in them. In a way my own experience was backing up JaredMan328's version of toy robot history, and that kind of drove me hexagonal nuts. So for the past few years I was extremely annoyed that a totally anonymous YouTube commenter could come out of nowhere and brazenly posit the toy robots equivalent of the theory of relativity and although I knew he was wrong, I had no definite concrete proof to disprove it. 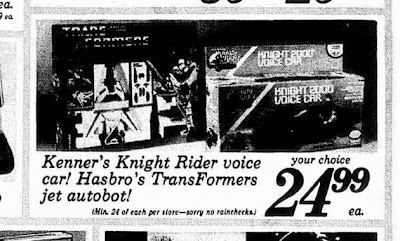 What gnawed at me most was that I had no Decepticon jet ad from before September of '84 and no Transformer ad at all earlier than August. 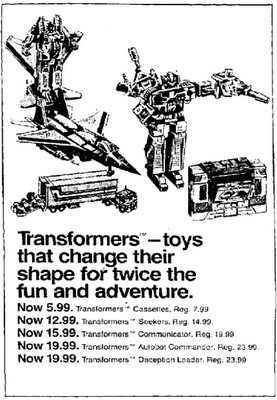 You can imagine my elation then at finding this Zayre ad from April 29, 1984 which not only reigns as the earliest Transformer ad I have ever found, but also soundly refutes JaredMan328's evolutionary theory of Cybertronians. Finally I had solid proof of Decepticon jets being sold before September of '84 and also other cars that were not Hound and Jazz being out as early as April. In my own experience I'd heard early Decepticon jet shipping cases had date codes printed on them confirming they shipped in March of '84, but without pictures of those cases I couldn't prove anything. The ad was nice to find because it provided solid proof of a version of events that I assumed was right from circumstantial evidence and common sense, but that I couldn't back up. Not only that, but the ad shed some light on another great Cybertronian mystery revolving around those first three Decepticon jets, namely the issue of where the term "seeker" came from. 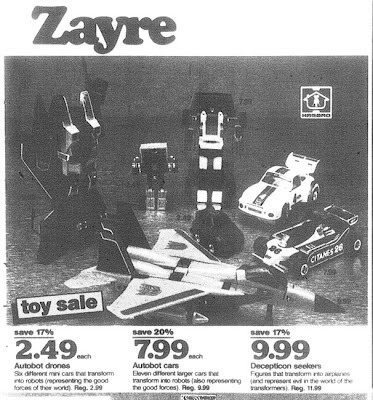 The Zayre ad is interesting because it uses two terms that pop up rarely in old Transformer ads-"drones" to describe the Autobot minicars and "seekers" to describe the Decepticon jets. "Seekers" only ever appeared in catalog and newspaper ads and not in the official cartoon or comic continuities, yet it somehow caught on with the fandom at large and eventually became official Transformer canon. 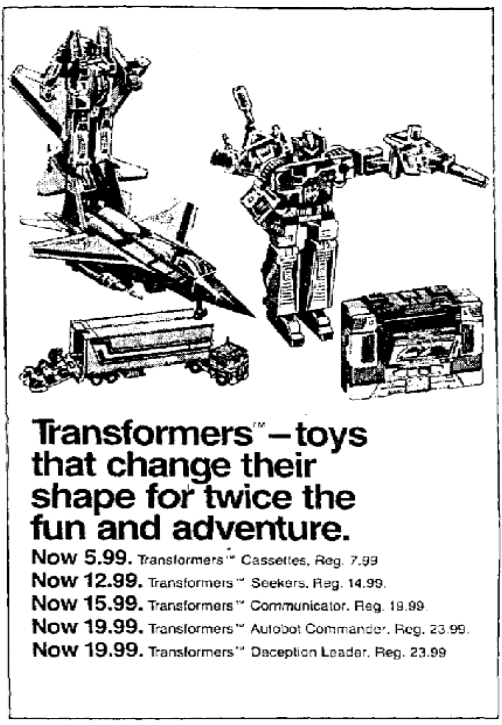 Referring to the minicars as drones didn't quite catch on and it's become an obscure footnote in Transformer newsprint ad history. But seekers! Lately I've been getting very lucky with finding ads in enough quantity that the term doesn't seem so obscure to me anymore. I've only ever come across two drone mentions but now I've got a total of four ads referring to the Decepticon jets as seekers. In addition to the April '84 Zayre, there's a November '84 Zayre, a November JC Penney ad and another November '84 ad from a store called Dahlkempers. I've updated the 1984 Decepticon Jets section at the Vintage Space Toaster Palace to include all of these. So what does it all mean? Well I would propose a theory that somewhere there must have existed promotional materials supplied by Hasbro to stores that used these terms. That's a bit of a no-brainer given the circumstantial ad evidence. But finding the exact source of promo material is a lot tougher. "Seeker" and "drone" do not appear in the Decepticon jet and Autobot Minicar pages of the '84 Hasbro toyfair catalog or the 1984 Hasbro price list. My best guesses are that these terms originated in the pages of the '84 line art catalog, '84 pre-Toyfair ordering materials or possibly on the cases themselves. But the line art catalog is my best guess since pre-Toyfair materials were long gone by November of '84 when most of the seeker-using ads came out. Retailers had to have something sent to them somewhat recently at that point and the best guess is it came from the line art book. But since I've never seen the line art book I don't know for sure and I can't explain why the term is not more widely used. Finally, I wanted to mention that I updated the Jetfire 1984 section of the Vintage Space Toaster Palace with all the earliest Jetfire ads I've ever found, including a really great one from a New York based retail chain called Alexanders from December 09, 1984 featuring a boxed Jetfire. Boxed Jetfires in any ads are super rare, and this is the only one I've found from 1984. It's very special because all the other '84 Jetfire ads I've seen either don't show the figure at all or only show a loose prototype of it. So here's a newsprint example of a production Jetfire still in the box. It's really awesome from a Roboplastological archaeologist point of view and I talk about it a little on the show.